『고려사절요(高麗史節要)』는 고려왕조의(918-1392)의 가장 중요한 역사적 기록물 중 하나로, 김종서를 위시한 28명의 조선시대 학자들에 의해 1452년 편찬된 책이다. 135권에 달하는 방대한 『고려사(高麗史)』를 35권으로 압축한 『고려사절요』는 사건들을 연대순으로 제시한 특징뿐만 아니라, 『고려사』에 나오지 않는 귀중한 정보들이 들어 있어 학자들은 물론 한국사 전반을 이해하는 데 중요한 기초 역사서이다. 이 영역본의 출간은 이 시기의 권위자인 슐츠 교수가 맡아 우리나라 최초로 영역(英譯)을 했다는 의의뿐만 아니라, 세계인들의 한국사와 동아시아 연구에 기여하고 한국 역사에 관심이 있는 외국의 일반 독자들에게 한국을 알리며 한국사를 인류의 보편사로서 자리매김하는 데 기여할 것이다. The Koryǒsa chǒryo (Essentials of Koryǒ History) is one of the most important historical records of the Koryǒ kingdom (918-1392). Presented in 1452 and compiled under the leadership of Kim Chongsǒ and 28 men, it appeared one year after the publication of the Koryǒsa (History of Koryǒ). Compressed to 35 books, this is an abridged version of the Koryǒsa. 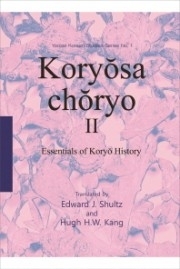 The Koryǒsa chǒryo offers a chronological presentation of the events of the Koryǒ kingdom. As each year unfolds the Koryǒsa chǒryo captures the spirit and feeling of Koryǒ, recording the triumphs and trials of the dynasty. This history describes the actions of the kings, the life of the court and its aristocrats, abbreviated biographies of noteworthy individuals, changes to Koryǒ’s social and political institutions, foreign contacts, as well as such natural events as floods, famines, and earthquakes. This volume covers the years from 1147 to 1259.